SHOOTING THE SHIZNIT : Lawler vs Maclin!! ----D-Rock posted this up on www.wrestlingnewscenter. I have been hearing rumors about this for a few months. I have no idea who owns the rights to that old Memphis footage, but wouldn't it be Jerry Jarrett?? It will be interesting to see how this case ends. MEMPHIS, TN (WMC-TV) - They've shared the ringside spotlight for years, but now, Jerry Lawler claims Corey Maclin took something Lawler wasn't willing to share: the rights to classic wrestling video clips. "Somehow, Corey sold for apparently $20,000, the rights to all my copyrighted video library, and these guys he's sold it to have produced a 20 volume DVD set and are selling in on the internet around the world," Lawler said Friday. In response, Lawler filed a civil warrant against Maclin this week. But Maclin's attorney questions Lawler's motives. "What proof does he have that he owns these rights that he's asserting?" attorney Ed Bearman asked. Bearman said Maclin, who is running for Shelby County Clerk, claims Lawler's actions are political. "Mr. Maclin is running for office, and he wants to make sure that he's associating with the right kind of people," Bearman said. Bearman thinks Lawler's legal filing is a return punch for a cease and desist letter Maclin sent to Lawler last month. "He (Maclin) didn't want him to use his likeness or recordings that exist, that are being a part of Mr. Lawler's new wrestling show," Bearman said. Lawler tells Action News 5 he has no plans to use Maclin's likeness on his new show. 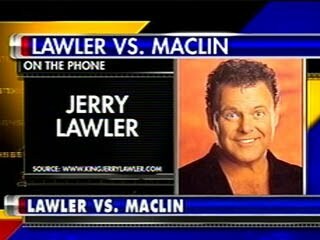 There's no word on when the battle outside the ring between Maclin and Lawler will make it to a court of law. Lawler says he helped Maclin get his start in wrestling, and now he feels like he's being stabbed in the back by a friend. Meanwhile, Maclin says he wants to distance himself from Lawler because he's doing business with people he'd rather not be associated with. Bobby Eaton in the Hospital?? Jeremy Moore - New Owner of MACW! !